Growing up I was never allowed to watch a lot of TV and the movies we did own on VCR were Disney, Julie Andrews films and the Pippi Longstocking movies thanks to my German mother. Most of the content (if not all) I consume is western media, so a 1950’s black and white Japanese film was an entirely new experience for me. I hadn’t seen any Godzilla films and had very limited knowledge on it asides from the fact that it’s some kind of monster. Because I’d never dabbled in any of the Godzilla recreations I couldn’t even conjure up an image of what Godzilla is meant to look like although I’m sure at some point I would have seen a movie poster somewhere. The name ‘Godzilla’ is familiar, but little else is. As such I didn’t have any idea what to expect of the film. I have so little knowledge of Godzilla I wasn’t even aware the film was originally a Japanese creation, and in my mind I had the assumption that it was a more recent Western creation, when in fact the Japanese film has had over 30 remakes since the original in 1954. Hesitations aside I was pleasantly surprised that whilst the film was something I would never watch by my own choice as I watched it I did become invested in what was going to happen. So all in all, Godzilla was an interesting viewing experience for me. Jerky transitions, dated effects and bad acting aside (Emiko always looked like she was happy whilst crying/screaming and it threw me considering most of her scenes included her in some level of distress) I was surprised that the movie was something other than what I expected and passed my (somewhat low) expectations. What I found most interesting, and hadn’t anticipated was the political comments that the film made. 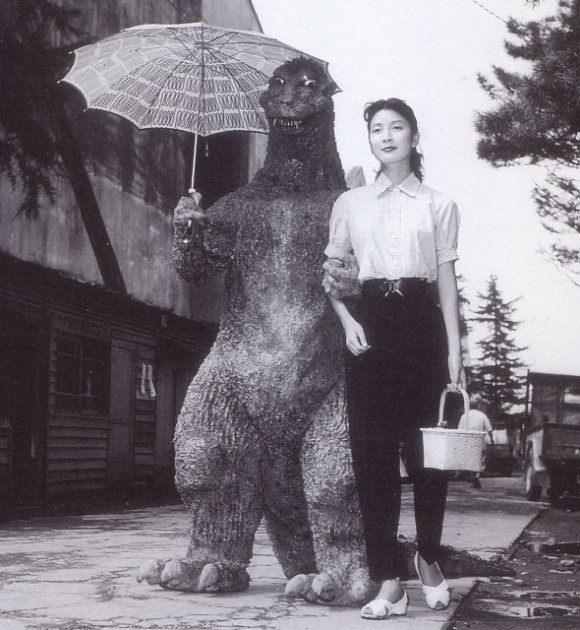 The original Godzilla was released in 1954, a time when people were still recovering from the horrific events of Hiroshima and Nagasaki. I don’t have extensive knowledge of WWII Japan, asides from what is depicted in other popular movies; most of which are American and portray the Japanese as the enemy. However, early last year I read a short novel titled Hiroshima, a literary journalism piece that recounts the experiences of several Japanese citizens who survived the nuclear bomb in Hiroshima. These personal accounts, as relayed by John Heresy, really confronted me and gave me a whole new insight to what happened in Japan during WWII as a result of nuclear weapons. (A really good read that you can find in the New Yorker if you’re interested). This text gave me a background to the theme of nuclear war that runs throughout Godzilla. I noticed throughout the film they would show the individuals affected, humanising the numbers affected by such disasters. For example, the people in Tokyo on the train discussing the horror of Godzilla and even mentioning having avoided Nagasaki, only later to show the same people on a boat attacked by Godzilla. The focus on WWII and nuclear weapons isn’t something I expected of the film. The anti-nuclear storyline and connection to WWII that ran throughout the film are probably what captured my attention and interest most, seeing the way in which the film expressed the fears at the time through an action flick involving a giant prehistoric creature. My main reflection is that the film ended up being a lot deeper than I though it would have been. I entirely expected some kind of monster and public panic (which there was) but what I didn’t expect were the underlying messages reflective of the time and events.